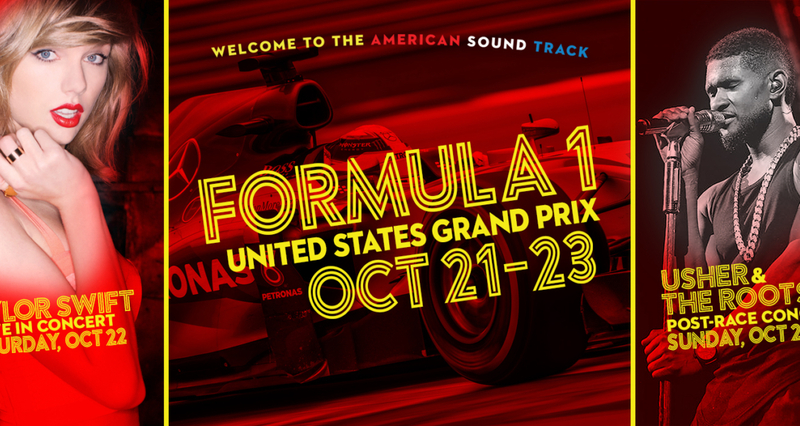 We look forward to welcoming you to Circuit of The Americas for the biggest ever Formula 1 weekend. Below is info to help you get to COTA and enjoy all the festivities surrounding our 5th anniversary celebration. With everything from schedules to food options, this is your quick reference guide to a weekend of fun. Get the most out of your USGP experience with the freshly updated COTA App. With the schedule, maps, food options, entertainment and much more, it's your easy reference guide to the USGP in the palm of your hand. It contains all the information below and more. Click the image below to view the full map. Reminder: Only guests who have already purchased a parking pass may drive on COTA's property during USGP weekend. If you did not purchase parking, please review the shuttle options below. 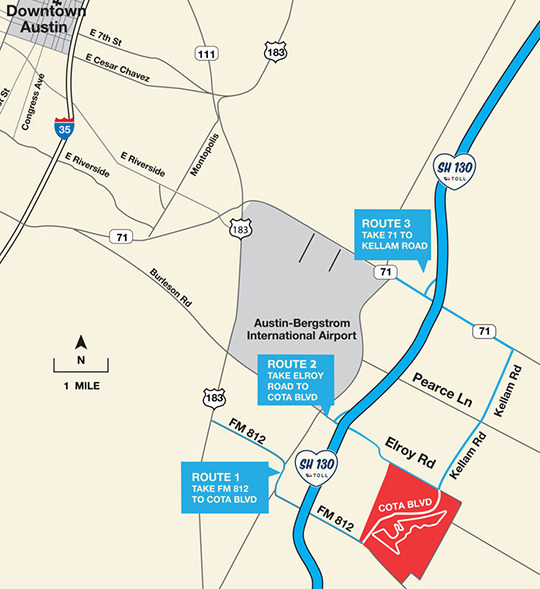 Circuit of The Americas' physical address is: 9201 Circuit of The Americas Blvd, Austin, TX 78617. Note: Directions below may not apply due to your starting location. Recommend entering the physical address into a GPS system to determine best route to COTA. Take SH130 (from Austin/San Antonio/Dallas) to FM 812 and travel east for 5.5 miles to Lot T.
Take Hwy71 (from Houston/Bastrop) to SH130 and head south. Take exit for FM812 and travel east for 5.5 miles to Lot T.
Only available online for pre-purchase. Purchase now for $50 per person each day to get dropped off near the main gate to the Grand Plaza along COTA Blvd. Available online for $15 per person each day, or you may pay $20 cash per day at the pick-up location - the Austin Convention Center. Available online for $15 per person each day, or you may pay $20 cash per day at the lot. Autograph sessions are open to all guests. Access to the drivers for an autograph will be on a first-come, first-served basis on the floor section of the Austin360 Amphitheater directly in front of the stage. The schedule is subject to change and will be updated within the COTA App in realtime if changes occur - iPhone or Android. Formal Grand Prix opening ceremonies will begin at 12:30 in the afternoon on Sunday, October 23. Before getting behind the wheel to compete, the drivers will be driven around the Circuit as they are introduced to the crowd. Known as the Showband of the Southwest, the University of Texas Marching Band will dazzle spectators with their impeccable showmanship and sound. The National Anthem will be performed by Retired Naval PO, Generald Wilson. Enjoy an awe-inspiring flyover by the 302nd Aviation Squadron from Ft. Hood at the end of the National Anthem. Guests will be treated to a special performance from the acclaimed band, known for its unique style for over 80 years. To learn more about the band and help them make it to the Macy's Thanksgiving Day Parade next month, go here. Download the COTA App to easily find all the entertainment activities and food options on the map. The Grand Plaza will be a hub of activity and entertainment during USGP weekend. With everything from a stage presenting live music from local musicians throughout Saturday and Sunday to a Texas-themed sports bar and roaming entertainment, the Grand Plaza is a must-see area during the weekend. Take a trip to the top of iconic Turn 1 to experience the spectacular view from the highest elevation around the Circuit. Multiple food and beverage options will be located around the hill, and live music will entertain guests on a stage near the Grandstand throughout Saturday and Sunday. A variety of food offerings will be available in this stretch of the track. You can also find live music throughout Saturday and Sunday, the popular Biergarten with delicious brews and event merchandise. Enjoy many options for food and beverages around the Turn 9 Grandstand. Guests in the Main Grandstand will find themselves surrounded by event merchandise, live music on Saturday and Sunday, multiple food options and more. Take a trip to the top of COTA's 25-story Tower to the glass-bottomed observation deck to see the stunning 360 degree view of the Circuit from a bird's-eye-view. Tower Observation Deck Tickets are offered at the base of the Tower during USGP weekend for $30 per person. Take in the views in style with a Chandon Sparkling Champagne upgrade for an additional fee. With everything from beloved Austin Tex-Mex to BBQ to American burgers and fries, there's a little something for every diet. Download our app (for iPhone or Android) to see a full list of food and drink vendors, as well as their locations and main menu items. Taylor Swift and Usher & The Roots will take to our COTA Super Stage in the Circuit's infield between Turn 11 and Turn 12. If you have yet to purchase a music upgrade to be closer to the stage, there are only a few remaining. Buy your music upgrade online now to enjoy Taylor Swift's concert or Usher & The Roots' concert from a dedicated standing pit in front of the stage. You can also swing by either box office or the Experience Upgrade Tent in the Grand Plaza to upgrade. Gates to the Circuit open at 8 a.m. Saturday and 9 a.m. Sunday. 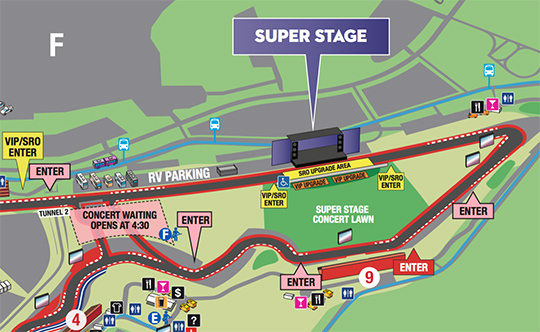 The gates to the Super Stage are tentatively slated to open at 5:30 p.m., however this time is subject to change due to the logistics of converting a Formula 1 track to a concert venue. • General Admission - GA concert guests will enter the Super Stage area from Turn 9 and Turn 11 (see pink "ENTER" marks on the map below). If you have a concert upgrade and are near Turn 9 or Turn 11, you may enter the festival lawn, head to the front of the lawn and proceed down the stairs to the upgrade section after presenting your upgrade ticket to the staff at the stairs. To see a full list of permitted and prohibited items, please go here or view the info in our COTA App. Note there are different restrictions for those in the upgrade areas. With backpacks and cameras prohibited in the standing and bleacher upgrade areas, we recommend storing them in your vehicle if you've parked on-site. Alternatively, you may check a bag or camera at any of our guest services booths set up throughout the Circuit (view locations on the map or in the COTA App). We will securely store your belongings in a locked space while you enjoy the concerts, and you can pick them back up afterwards. Disability assistance carts are on standby to assist guests with disabilities. Please make a request through any event staff, or call one directly at 512.655.6217. ADA Services Tents will also be located outside the gates of the Main Grandstand, Grand Plaza, Turn 1 and Turn 4. If you need assistance and do not see any staff nearby, please contact us via our text alert system. Text 69050 with the acronym "COTA" followed by your request or question. If it's a location-based inquiry, please include your location. Bud Light Fan Fest will take place Friday, October 21 through Saturday, October 22. Join us each evening in downtown Austin on 6th Street for a free continuation of The American Sound Track celebration. Keep the party going with experiential and exciting activities, including car displays, a visual walk down F1 memory lane, activations from Facebook, Bud Light, Topo Chico, Perky Jerky, Advance Auto Parts and much more.